Mississippi River flooding has closed a portion of Bettendorf's River Drive to vehicular traffic and created (temporarily) a wide, quiet walking "path" along the riverfront. The recent snow melt reveals a weathered and battered dock and debris along the Mississippi River shoreline. Duck Creek rises with the temperature. Recent melting due to the rain and warm temperatures has caused Duck Creek to throw off its shackles of ice. The water has risen and carried off much of the ice that once covered its surface. 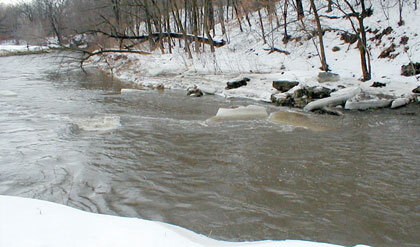 Read more about Duck Creek rises with the temperature. Our community portal is now powered by a database engine which enables anyone viewing our site to submit events, articles and even photos from their own computer. To submit an article, click on √É¬¨Submit News√É¬Æ in the upper left box "Inside." Type in your information, preview and then post. That√É¬≠s it. If you have a photo to accompany an article, e-mail (in jpeg, tif or gif format) to: gah@gah.com and indicate which article it should accompany. Want to add your thoughts about a posted article or event? Click on √É¬¨comment√É¬Æ and post your reaction. If you become a registered user, you'll be able to post articles, information, events with your own name/nickname. Use Bettendorf.com to make your company announcements or post your organization√É¬≠s upcoming events. There is no charge. With 3,000 visitors per month, Bettendorf.com is the best way to reach people living and working in the Bettendorf-Pleasant Valley community. Quad Cities networking integration firm, Lantech, is hosting two information technology seminars for business owners and computer professionals. Permits for new single-family residential construction in Bettendorf/Pleasant Valley declined in 2000. The total for the 12 months was 143, compared to 158 in 1999. Voters' guide to PV Instructional Support Tax Levy referendum Feb. 20 / What is it? Why it's needed? How much will it cost school district residents? PV School Board sets 2001-2002 calendar; approves cooperative swimming agreement with North Scott. Bettendorf High School's drama troupe will be performing the musical, "You're a Good Man, Charlie Brown," on the weekend of February 16. Bettendorf ran out of gas in the fourth period and fell to seventh-ranked Muscatine 67-51 in boys MAC action Friday night. The Interstate 74 Bridge across the Mississippi River at sunrise. Have a story suggestion for bettendorf.com?